BlueTie is an app that is trying to accelerate professional networking in a meaningful and practical manner. I spent considerable time with this app and here is what I think about this new kid on the block. Networking is an essential part of anyone’s life today. There is an inherent need to network if we are looking to get work or looking for people to collaborate with in any given scenario. Networking is rooted deep in the human need for support, validation and assistance. So as a race, we humans have been networking since the inception of time, it is just that with the evolution of technology and lifestyles, the way we network has also evolved. In the early days, word-of-mouth and personal referrals helped to connect people. They have now been replaced with social, professional and personal networks that serve a lot of practical purposes when we need to get things done. But all the technology and platforms today have one major hitch that bothers a lot of people – the effort and time needed to actually network. Whatever platform you are on, there needs to be a regular, consistent and sustained effort to keep building your personal network and growing it. Only if you are ready to invest time and effort in networking will you be able to build a network that is wide and deep enough to help you to get things done and practically leverage it. This is where many people lose out, by nature, a lot of us are adverse to the effort and energy needed to network, but every platform demands it. All platforms from LinkedIn to Facebook to Twitter demand this. What if I told you that there is a way for you to instantly build a network that you can leverage to get whatever you need and tailored to you? Well there really is one app that helps you do this and you should be on it right away. 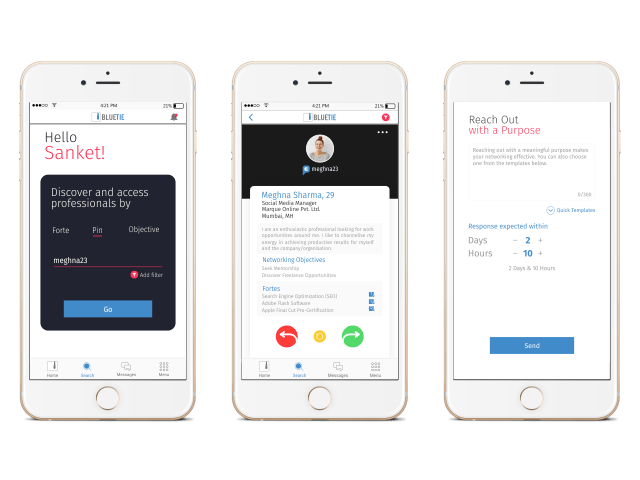 The BlueTie App is a very refreshing new approach to networking where you choose your objective when you join and based on why you need to network, you are connected to like-minded people who make sense. This is a quantum leap over the mundane and strenuous networking platforms of today that take effort and a lot of pain. I have been on this app for a while and I am totally impressed with the simple flow and easy interface that gives a great user experience. 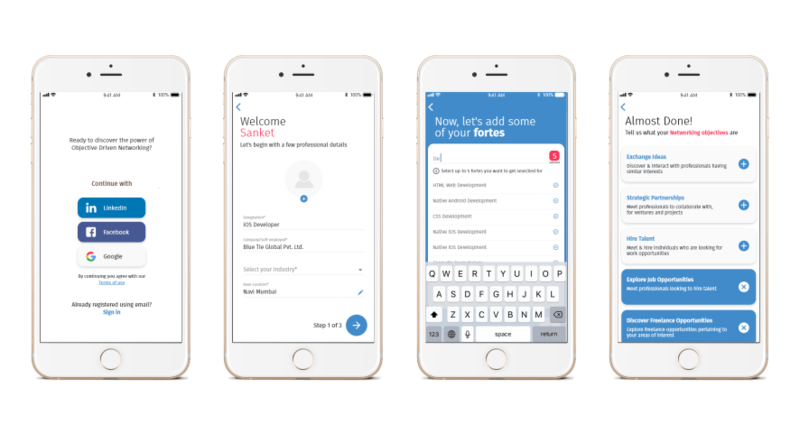 On-Boarding was a breeze and the app download and subsequent signup are very smooth and simple. The App does not guzzle battery or storage and has a pretty light footprint. Right up front, the app has the option for me to set objectives, or in common terms, the why of me being on it. I may be looking for a job, or for investments or mentorship. I may be an investor looking to invest in a good value proposition. I may be looking for mentorship or guidance. There are then very subtle and strong data points and filters that connect me to the right people based on my needs. I really like that fact that all I have to do is be clear about my objectives and the app does the networking for me. There are also a lot of nifty features like very local and granular search parameters that will optimize the time and effort required to connect and get things done. There is also a neat feature where acknowledgements are time bound and I can actually set a time interval for people to respond to my request and they will be reminded to do so. There is a very useful feature called the BlueTie Pin which gives users a safe and very obfuscated but transparent way to interact with other people without any apparent loss of privacy to the user. I am a big fan of this feature. This is something that is lacking in LinkedIN, FB and Twitter big time. And all along, the most impressive and important part of all this is the fact that this feature-rich and objective oriented networking starts from the minute you are on-board and there is no need to go around building a personal network on the app. This is like professional networking 2.0, a great step ahead from today’s conventional platforms. And synergy is the key word across the app. I am a very heavy social media user and I am active on almost of important platforms. The ease that BlueTie gave me over other apps is very considerable and I am planning to stay on it for a long time. The App has the right objective in mind and is solving a key issue. We need to get on the app and encourage more people to get on it so that the BlueTie user base grows and along with it, our network too. In my opinion, this is by far the best professional networking app that I have used in a long time and I would urge all my friends to get on it right way. It gets 5 stars from me.